My first blog post on WOT contained some stats on WOT’s current ratings for skeptic and believer websites. I generated those using a script to pull the WOT ratings en masse using their published API. So I have data on the WOT ratings of several hundred skeptic websites as they stood in March that can be used as a baseline. Of the 50 websites posted in the first five WOT Project posts, I had data from March on 43. I then used the same script to pull current WOT ratings for all 50 sites. It is straightforward to compare the two sets of data. (I didn’t use the sites posted in WOT Project Volume 6 because they were just posted on Monday – there hasn’t been much chance for them to improve yet). WOT compiles four scores (trustworthiness, reliability, privacy and child safety) with a confidence value reported on each score. As before, I’m going to focus on the trustworthiness score here, as it is clearly the most relevant to skeptic sites. 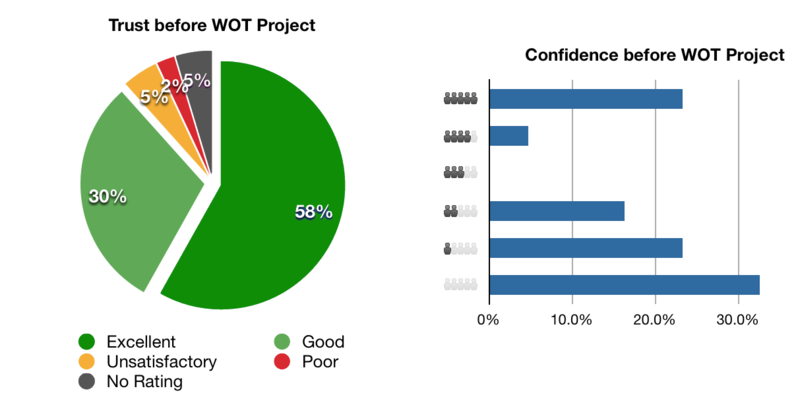 As you can see, we weren’t in bad shape to begin with (as my original blog post had indicated) – a total of 88% of the sites had Good or Excellent trustworthiness, and thus would have a green icon in WOT. But at the same time about 12% had either bad scores or no score at all. Confidence values are not terrific, with only about 28% of the sites having high confidence scores (top two results). A larger number of sites have zero confidence (33%). That’s not good because it means our site scores could potentially be changed easily by those with an axe to grind about skeptics. Clearly, a big win. All fifty sites now have green icons, and a much larger percentage have “Excellent” as opposed to “Good” trustworthiness. Confidence is much increased as well, with no sites left with zero confidence, and 42% of them up in the highest confidence tier. Although many skeptic sites already had good ratings in Web of Trust, The WOT Project has clearly demonstrated its value in its first six weeks. Overall ratings have been improved, and none of the selected sites show yellow or red icons any longer. Confidence values have improved as well, presumably helping to insulate the ratings of skeptic sites against malicious attacks by believers. The WOT Project is an excellent example of an online skeptical tool with a simple goal that makes great use of crowdsourcing. I congratulate Erik on his efforts and encourage all web-surfing skeptics to get involved. It’s equally important to take the time to rate sites that give resoundingly bogus information on alt med scams and the like. Tim. Does everyone who visits a negative WOT rated site get that rating warning? Or do you have to be a member of WOT? Has sent 26 referrals to my blog on homeopathy. Wondering if the readers of that URL just ignore the warning, or maybe not see the warning? You don’t have to have an account on WOT, but you do have to load the WOT browser plugin in order to get the warning screen. I doubt many true believers would keep WOT loaded for very long, because many of their favorite sites would have those annoying warnings in front of them. There are some other places you could get a warning or signal from WOT indirectly. For instance, at one point Facebook was using WOT scores to vet external links posted by users. You’d get a warning from Facebook when you clicked the link, even if you did not have WOT yourself. I haven’t seen one of those warnings lately, so I think Facebook might have backed off this a little due to user complaints. But in general, you have to load the WOT software on your own computer in order to see warnings/ratings automatically.